Bus from Batu Pahat to Johor Bahru is the most common and convenient transportation option for residents in Batu Pahat in Johor Bahru who are studying and working in Johor Bahru. Bus service is the only transportation option to travel from Batu Pahat to Johor Bahru because there is no flight and train service available for this route service. Causeway Link, KKKL Express and S&S International Express are the three major bus operators serving bus from Batu Pahat to Johor Bahru. These bus operators are local favourite brands because of their excellent service and punctuality. The earliest departure goes at morning at 7:00am, while the last one is in the evening at 8:00pm. Bus leaves Batu Pahat Bus Terminal for Johor Bahru almost every 30 minutes. The travel time for bus from Batu Pahat to Johor Bahru takes on average of 2.5 hours, depending on the road traffic condition on your travelling day. The bus fare costs in a range of RM 11.00 to RM 12.00, depending on your selection of bus operators. S&S International Express offers child fare at RM 8.80. There are two selections of pick up point in Batu Pahat, Batu Pahat Bus Terminal and Parit Raja. Passengers could choose the pick-up point which is more convenient for them to board the bus. The drop off point in Johor Bahru is Larkin Bus Terminal. Passengers that arrive in Larkin Bus Terminal could take city bus or taxi from there to their next destination. 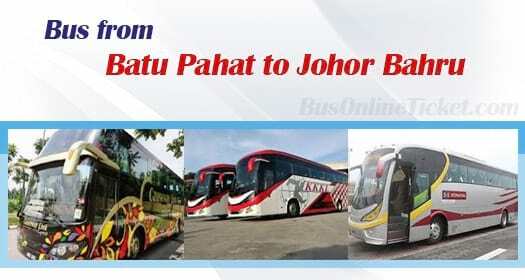 Booking your bus ticket from Batu Pahat to Johor Bahru online with BusOnlineTicket.com is the best way to make your life easier. It is very easy, safe and hassle free online ticketing portal to allow you to book your bus, train and ferry ticket online. Your booking for bus ticket in BusOnlineTicket.com is instantly confirmed upon payment.